Can You Copyright Your Dumb Joke? And How Can You Prove It's Yours? : The Two-Way "Joke theft" sounds funny, but that claim is at the heart of a lawsuit lodged against Conan O'Brien. The case brings thorny questions of humor to the courtroom, a place not always known for jokes. 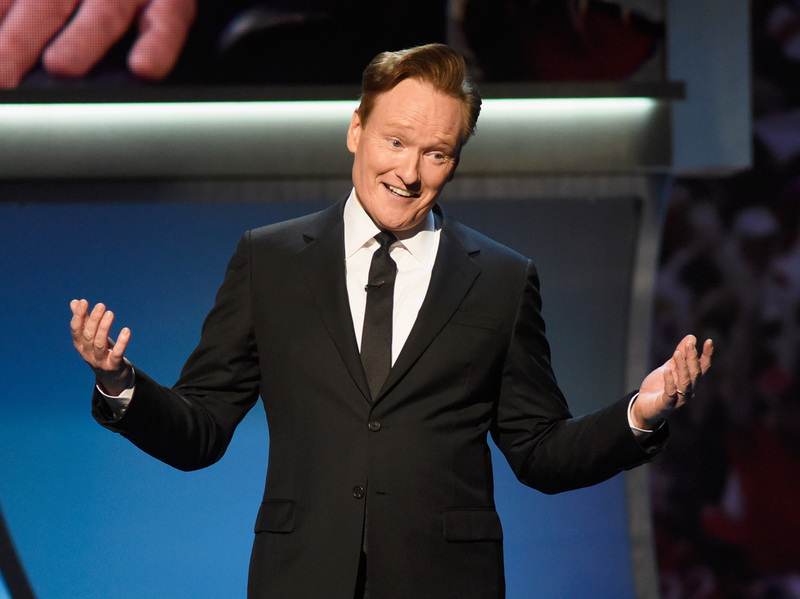 Conan O'Brien in 2016. He is being sued by a writer who accuses him of stealing jokes. O'Brien says the idea of stealing someone else's comedy makes him physically ill.
Kaseberg is a comedy writer who has written over a thousand jokes used by Jay Leno over the last 20 years, according to court documents. On his blog, Kaseberg regularly writes posts with a dozen or more jokes — topical humor styled in two-beat form used by late-night hosts in their monologues. At the heart of the lawsuit are five not-amazing jokes. On Dec. 2, 2014, Kaseberg posted this to his blog: "The University of Alabama-Birmingham is shutting down its football program. To which the Oakland Raiders said; 'Wait, so you can do that?'" In his monologue on Conan the following day, O'Brien said, "Big news in sports. University of Alabama-Birmingham has decided to discontinue its football team. Yeah. When they heard the news, New York Jets fans said, 'Wait can you do that? It's something you can do?' "
A month later, in January 2015, a similar thing happened. Kaseberg posted a joke about passengers on a Delta flight fighting over the armrest; a few hours later, O'Brien delivered a very similar joke on his show. Kaseberg tweeted a couple days later at Mike Sweeney, the head writer for Conan, saying he was "95% sure" that he had a joke from his blog used on the show: "I'm not upset, [but] would like the opportunity to contribute jokes." The next month, Kaseberg saw O'Brien deliver two jokes very similar to ones he had posted on his site. Kaseberg then said he reached Sweeney on the phone, where they had what Kaseberg called an "agonizing" conversation, in which Sweeney "angrily and loudly denied those were my jokes. He was furious that I was accusing them of stealing jokes, but most of all he was incensed that I would suggest his writers would have anything to do with my pathetic blog and [its] author, me, a no-name failure." In June 2015, Kaseberg and O'Brien made very similar jokes about Caitlyn Jenner; a month later, Kaseberg filed a lawsuit against O'Brien, his writers, executive producer, production company, TBS and Time Warner. Which brings us to last week, when a U.S. District Judge Janis L. Sammartino ruled that the case will head to court. And that means close scrutiny of late-night monologues — which aren't really designed for close scrutiny. How many ways can you write a joke? Kaseberg's case is an interesting one: not only because the judge evaluated the originality of a "shrinkage" joke about the Washington Monument, but because lawsuits of its kind are rare. "The most surprising thing to me about this lawsuit is that it was filed in the first place," says Aaron Perzanowski, a professor on intellectual property law at Case Western Reserve University. "When you're talking about accusations of infringement dealing with fairly low-dollar-value creative work, we don't see a lot of litigation." Judge Sammartino threw out the jokes about UAB football and the Delta flight (finding in the latter case that one of O'Brien's writers had already pitched a similar joke before the one on the blog appeared). That left Kaseberg with the Tom Brady Joke, the Washington Monument Joke, and the Jenner Joke, as the judge labels them. The jokes written by Kaseberg and O'Brien's staff, the judge ruled, are "sufficiently objectively virtually identical" in those three instances. To win, Kaseberg's lawyers will need to show that the defendants "willfully infringed Plaintiff's copyrights." So how much copyright protection do jokes get? In this case, the judge ruled that the jokes get a "thin" protection. That's because, the judge writes, the copyrighted work (Kaseberg's jokes) "is composed largely of 'unprotectable' elements. ... [S]imilarities derived from the use of common ideas cannot be protected; otherwise, the first to come up with an idea will corner the market." Let's take a look at the Jenner Joke. This was Kaseberg's: "Three towns, two in Texas, one in Tennessee, have streets named after Bruce Jenner and now they have to consider changing them to Caitlyn. And one will have to change from a Cul-De-Sac to a Cul-De-Sackless." And O'Brien's: "Some cities that have streets named after Bruce Jenner are trying to change the streets' names to Caitlyn Jenner. If you live on Bruce Jenner cul-de-sac it will now be cul-de-no-sack." Very similar? Yes. Kind of a groaner? Also yes. But just because two things are similar doesn't mean that one is a copy of the other. "If you put a copy of the day's newspaper in a room with 100 different comedy writers, you're going to see lots of the same jokes where lots of people are circling the same formulation and often the same punchline independently," says Perzanowski, the law professor. "That doesn't mean they're copying from each other. But people do have a tendency, when they see those similarities, to attribute that to copying rather than independent creation." "There's a finite number of formulations of that Caitlyn Jenner cul-de-sac joke," he adds. "You can tell it three or four different ways but they're not very different from each other. Is a lawsuit the best way to resolve joke theft? In its way, this line from the judge's opinion is much funnier than any of the jokes Conan delivered: "the common threads between all of the jokes are merely the ideas that (1) the Washington Monument looks like a phallus and (2) the Monument may therefore respond to cold weather by shrinking." But the cognitive dissonance of a district court judge writing in legalese about this dumb joke evinces a not-dumb point: Maybe judges aren't the best judges of humor, or courts the best place to resolve ethics of comedy. In 2008, law professors Dotan Oliar and Christopher Sprigman published a paper that explored the norms comics had established to protect their intellectual property: their jokes. In stand-up comedy, they write, "social norms substitute for intellectual property law. These norms track copyright law at times: for example, the major norm at work is one against publicly performing another stand-up's joke or bit. More often than not, however, the norms deviate from copyright law's defaults: for example, whereas copyright protects expression but not ideas, comedians' norms protect expression as well as ideas." And those norms aren't "merely hortatory," they write. "They are enforced with sanctions that start with simple badmouthing and may escalate from refusals to work with an offending comedian up to threats of, and even actual, physical violence." But even that system doesn't keep everyone in line. Many extremely successful comedians are regularly accused of stealing jokes. Bob Hope used to joke that Milton Berle "never heard a joke he didn't steal." And according to a 2007 story in Radar, comics at the Hollywood Improv in the '80s would use a light to signal the presence of Robin Williams, "comedy's most notorious joke rustler"; the comics would wrap up their sets quickly fearing that Williams would make off with their material. Even if the informal system doesn't nab every thief, it does offer one distinct advantage: a jury of one's peers. "In the particular instance of standup comedy, courts do not have a great wealth of prior case law or precedent to draw on," says Perzanowski. "That's one reason that I think these informal systems tend to have an advantage over the formal judicial process," he says. "Because no one is in a better position to understand what makes a joke funny, what makes a joke original, what makes a joke commonplace, than a group of comedy writers themselves." And O'Brien isn't laughing about being called a joke-stealer. "Accusing a comedian of stealing a joke is the worst thing you can accuse them of, in my opinion, short of murder," he said in a deposition. "I think it's absolutely terrible." "I take it really seriously," he said. "So the notion of stealing someone else's comedy makes me physically ill."
Kaseberg v. Conaco may be in court because it doesn't spring from the world of standup comedy, but from the deeper pockets of television comedy. Kaseberg isn't suing some small-time comic; he's suing TBS and Time Warner. Can you really copyright a dumb joke? "The question really focuses on originality, and there is no freestanding barrier to copyright extending to a joke on any topic ... so long as that joke meets the fairly minimal requirements for originality," says Perzanowski. "That means it has to demonstrate some low level of creativity and importantly that it not be copied from some other source." "Copyright will give you protection for this specific arrangement of words," he says, but not for a whole subject matter. When it comes to topical comedy, he says, the question is whether one can separate an idea (which can't be copyrighted) from its expression (which can). Judge Sammartino agrees. "[T]here is little doubt that the jokes at issue merit copyright protection," she writes, citing the relevant case law, "noting originality requires only independent creation of a work that 'possess[es] some creative spark, "no matter how crude, humble or obvious" it might be.'" However, she adds, the jokes here "are similarly constrained by their subject matter and the conventions of the two-line, setup-and-delivery paradigm." The result is that for O'Brien's jokes to infringe on Kaseberg's copyright, they must be "virtually identical," one step below verbatim. CBS reports that unless there's an out-of-court settlement, the case will go to trial in August. The case may indeed hinge on questions like how many ways there are to make a cul-de-sac joke. Because, as Sammarino notes, a joke's originality is constrained by its format. "Each joke begins with a factual sentence and then immediately concludes with another sentence providing humorous commentary on the preceding facts," she writes. "Facts, of course, are not protected by copyright." Those of us who tell dumb jokes may hope that the case doesn't go to court. After all, many of us are kept in line just by being told our jokes aren't that funny — no copyright protection needed.